HomePolitics‘Dangerous people are coming here and the good people are dying,’ Trump Warns in Texas Visit. April 10, 2019 Politics Comments Off on ‘Dangerous people are coming here and the good people are dying,’ Trump Warns in Texas Visit. SAN ANTONIO, Tex. — President Trump said on Wednesday that migrants pouring across the border with Mexico are dying in great numbers while other gang members arriving from Central America are marauding and threatening American ranchers. The president used a high-dollar fund-raiser here to call attention to a situation that he said has been ignored in the media: the plight of migrants who cross illegally into the United States and then die of thirst or hunger. 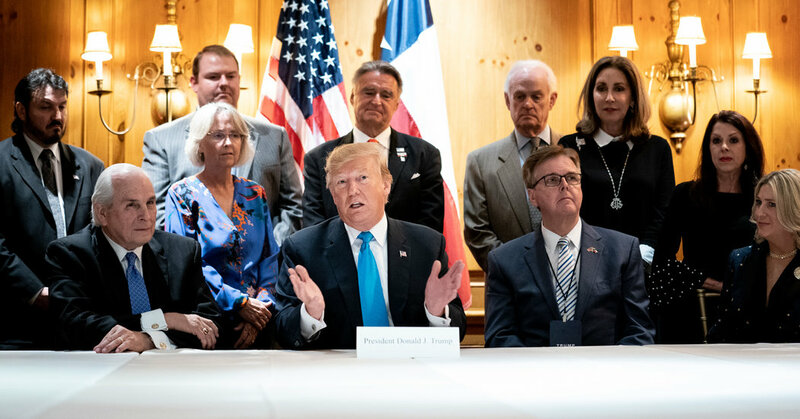 “This never comes out in the fake news,” Mr. Trump said as he recounted the stories about migrants that about a dozen donors told him privately at his first stop in a visit to Texas that will take him to Houston later in the day. At Mr. Trump’s urging, several of the donors described finding the bodies of migrants — including pregnant women and children — in the vast brush of their property. The president said that he had never heard the stories of migrants dying, even from his top immigration and border patrol officials. In fact, migrant advocates have for years documented the grim fate of some migrants who grow sick and die attempting to make it into the United States. The advocates say Mr. Trump’s policies have made the problem worse by limiting the number of migrants who can legally claim asylum at ports of entry, pushing more migrants to cross at remote areas of the border. Several of the donors also told of how afraid they have felt when migrants from Central America, dressed in black, turned up at their homes. “Dangerous people are coming here and the good people are dying,” Mr. Trump said, adding that the donors had all told him that the answer to the problem was to build his wall along the border with Mexico. The president, who was joined at the round table with donors by Brad Parscale, his 2020 campaign manager, denied that the unscheduled remarks to reporters about the border were part of a campaign message. But moments later, as he attacked Democrats for failing to address border security, Mr. Trump said that immigration would be a tremendous issue for him and other Republicans in the 2020 campaign. The issue of immigration and border security has been at the center of Mr. Trump’s political life for years. Fifteen days before the 2018 midterm elections, he held a rally in Texas to deliver dire warnings about immigration that helped Ted Cruz, the embattled Republican senator, win his campaign for a second term. As he travels in Texas on Wednesday for a series of fund-raisers and round tables with supporters, Mr. Trump will not be alone in discussing the importance of immigration and America’s role in confronting the plight of displaced people. Julián Castro, the former housing secretary under President Barack Obama and now a Democratic presidential candidate, will host a rally in San Antonio, his hometown, that will focus on immigration, setting up a split screen in this border state that underscores the issue’s potency for 2020. Mr. Castro’s rally is expected to feature English and Spanish speakers and is being billed by his campaign as an opportunity for San Antonio, with its significant, longstanding Mexican-American population, to show its resistance to Mr. Trump and his border ideology.